Subway tile kitchen backsplashes have been common in commercial kitchens forever, it seems, but in recent years many homeowners have chosen these efficient and stylish backsplashes for their kitchen designs. The classic, understated look of subway tile is extremely versatile—it can be paired with just about any kitchen style, from traditional to hyper-modern. Generally, subway tiles are small to medium-sized and rectangular in shape. They’re available from home improvement stores or tile specialty retailers, both online and in store, in a seemingly endless variety of materials, colors and textures. The versatility of subway tile has made it an extremely popular choice among homeowners, which has led to its wide availability in a diversity of styles. If you’ve decided that subway tile is the right style for your kitchen backsplash, your first task will be to determine exactly what tile material you want to feature. You can browse the available choices online or in-store, and you’re likely to find that subway-style tile is available in just about any type of backsplash material, from ceramic to glass to high-end granite. 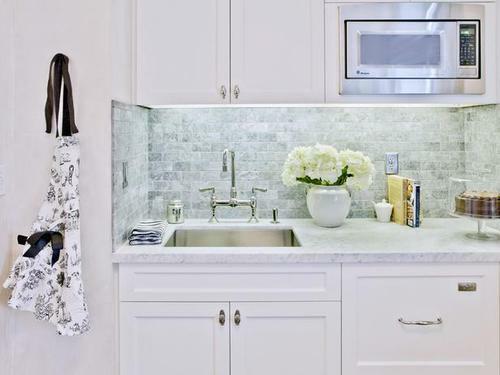 Your personal style and desire to match or diverge from the overall style of the kitchen—in addition to the budget you’ve settled on for your backsplash project—will likely be the deciding factors here. When you’ve determined what material you’ll be using, it’s time to figure out how much you’ll need to source for your subway tile project. Measuring the surface area you need to cover to determine the square footage will give you this figure. In general, backsplashes cover the portion of a kitchen’s walls above the countertops which will be most at risk from cooking or cleaning spatter. However, if your subway tile vision includes a grand execution that stretches from countertops to ceiling, go forth undaunted—there are no hard and fast rules for how much backsplash is too much. When you’ve determined the amount of subway tile you’ll need for the project, it’s installation time. Subway tile can be anywhere from extremely simple to extremely difficult to install, depending on the material you’ve chosen, the layout of the area you’ll be covering, and the pattern of the tile. If you’re a novice when it comes to tile installation, you’ll probably want to hire a professional to install your subway tile backsplash. Alternatively, if you’ve got serious DIY chops or have installed backsplash tile before, you may want to try installing the backsplash yourself for a considerable savings.